www.stma.org March 2017 | SportsTurf 19 PCU products, which allows protection of N during cool periods when plants exhibit little or no growth and soils are often susceptible to N losses; followed by release of N as temperatures increase and plant growth and N uptake increase. Diffusion of N through the polymer coating is driven by an N concentration gradient, with temperature being the primary regulator under irrigated conditions. Some PCU sources steadily supply plants with N for longer periods of time following application than immediately soluble forms of N, thus enhancing NUE and leading to increased crop yield and quality. Hyatt et al showed that the slower release of N from PCU can improve economics by eliminating additional in-season N applications. Research has also demonstrated the ability of PCU to mitigate negative environmental impacts associated with N fertilizer. 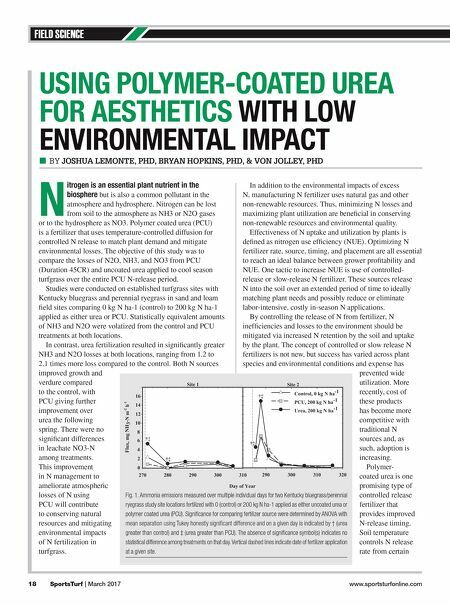 Polymer- coated urea was shown to decrease NO3- leaching, NH3 volatilization and N2O emissions. But most work investigating anthropogenic inputs to aeration Scan the QR code to see the "One & Done" video! "Aerating in tight landscaped areas is effortless with the reverse feature, plus excellent hole spacing while operating at high speed in forward & reverse wastes no time getting the job done. The One & Done aerator is a solid hit with our grounds crew!" – Evan Fowler; Grounds Keeping Manager Kansas City Royals EAsy As 1-2-3 FinAncing! www.billygoat.com The ultimate in outdoor cleanup and return on investment! Award Winning AE1300H Hydro-Drive, Hydro-Tine Aerator • 30" wide aerating productivity and up to 4.3 mph • Aerate wet or dry, saving time and maximizing productivity • Variable Aeration Density (VAD ™ ) offers 8 to 48 holes per square ft. in one pass • In-ground turning for unmatched maneuverability • Reverse aeration adds even more productivity • FLEXTECH ™ arms drive plug depths up to 2x that of drums • Self-propelled variable speed hydro-drive takes the chore out of the chore • 8 tines and 4 bolts offer fast and simple tine service Fig. 2. 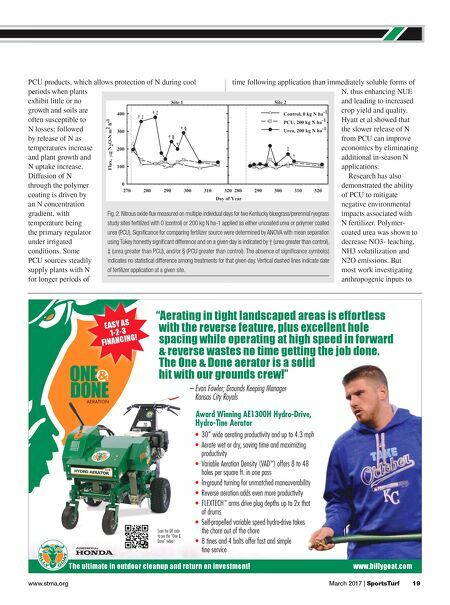 Nitrous oxide flux measured on multiple individual days for two Kentucky bluegrass/perennial ryegrass study sites fertilized with 0 (control) or 200 kg N ha-1 applied as either uncoated urea or polymer coated urea (PCU). Significance for comparing fertilizer source were determined by ANOVA with mean separation using Tukey honestly significant difference and on a given day is indicated by † (urea greater than control), ‡ (urea greater than PCU), and/or § (PCU greater than control). The absence of significance symbol(s) indicates no statistical difference among treatments for that given day. Vertical dashed lines indicate date of fertilizer application at a given site.